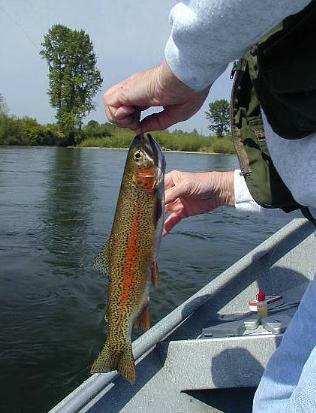 There are hundreds of Oregon fishing guides, many on the McKenzie River, our specialty, near Eugene. All can get their clients into trout, salmon and steelhead when the fishing is easy. Problem is: the fish are not always cooperative. The lack of success can be especially magnified if your McKenzie River fishing guide specializes in fly fishing, and only one fly fishing method. Weather and water levels can be unpredictable. Yesterday’s willing trout is moody and sulking today. Some flyfishing guides can adapt. Many can’t. Our McKenzie River fly fishing guides do: special McKenzie River fly patterns, precise leader rigs, effective presentations, moving to different holding-water locations as the fish move to new positions. Using Oregon’s McKenzie River --- our local favorite --- as the example, we see many McKenzie River fishing guides and do-it-yourself anglers who restrict themselves to topwater strategies, using either dry flies or emerging wet fly patterns on, or near, the water’s surface. In March and early April, when the March Brown mayflies are hatching, surface fishing can be effective, BUT usually for only a brief period of the day. Often, this productive span lasts less than an hour. If you are paying for an eight-hour fishing day, what do you do with the other seven hours? 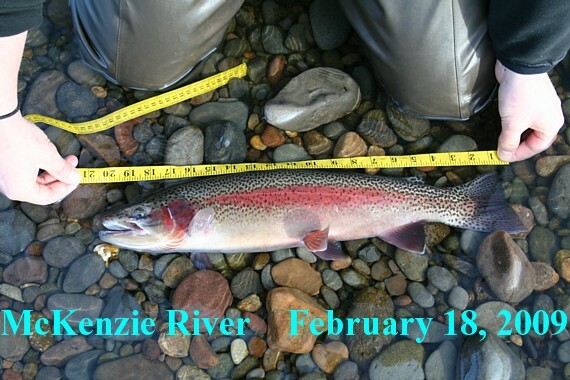 The McKenzie River is famous for its native "redsides" rainbows. If the water is warm enough, late February will see the beginning of the mid day March Brown mayfly hatch. Rising fish will take an adult or cripple pattern with consistency. When the McKenzie River trout are not rising, a well-presented deep nymph will produce some of the year's largest trout from February thru mid April. As the water continues to warm on the McKenzie River into May and June, surface fishing with dry flies and soft hackle patterns becomes more consistent. Our McKenzie River fly fishing guides love to get their clients into rising rainbows and cutthroat, or on any of the other trout streams we fish. Watching the splashy grab of a dry fly is always a thrill. (At risk of a heart attack, you may even raise a steelhead on a dry fly when the conditions and time of year are right on some of our rivers.) Unfortunately, the fish are not always willing to take a dry fly or shallow-running wet fly. That’s why OUR McKenzie River fly fishing guides have been schooled to become experts in nymph fishing. Nymphing is th e most difficult and least-understood of the fly fishing methods. On the other hand, it is usually --- by far --- the single most effective fly fishing technique for taking trout . . . and steelhead. Another appealing result of effective nymph fishing is that this method usually produces the larger fish. If the popularly-used statistic that trout utilize aquatic insect nymphs for up to 90% of their daily diet is true, it is only common sense to add nymph fishing to your fly fishing strategies. Strangely, we do not encounter many nymph anglers on the McKenzie River. 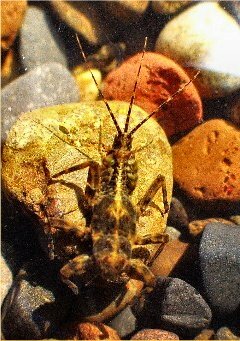 Whether we are guiding you on the McKenzie River, Siletz, Alsea, Willamette, South Santiam, or Rogue River, we will show you as much or as little as you want about fishing nymphs effectively. Small details make a big difference: special McKenzie River flies, leader rigs, effective presentations, and detecting the subtle strike. Our McKenzie River fly fishing guides can teach you this Fine Art, in addition to helping you fine tune your casting, presentation and line control for wet flies and dry flies. All this as you ride high and dry in the comfort of a McKenzie River-style drift boat. Wading is an optional activity on our McKenzie River guided fishing trip.